Payday lending has been getting a makeover of sorts recently. A number of banks, including Wells Fargo, have discontinued their payday-like direct deposit advance programs after federal regulators tightened their guidance over the high-cost products. Now, a number of state legislatures are discussing payday lending reform bills, which they say will make short-term loans safer for consumers. But are they truly helpful to those who need them? Not quite, say consumer advocates. Each year, state legislators around the country introduce, debate, and even pass a number of bills claiming to better serve consumers who need help with short-term, low-value loans. States such as Missouri and Utah are currently discussing the merits of such reform bills. The Missouri Senate approved SB 694, which bans rollovers, requires lender to offer an extended payment plan and removes a current interest and fee cap of 75%. The Missouri House is currently reviewing the bill. The Utah House and Senate passed HB 127, which modifies the reporting requirements for deferred deposit lenders, requires lenders to file any lawsuits where borrowers live or obtained the loan and requires lenders do minimal checking to see if borrowers can afford loans. The bill is now waiting for the governor’s signature. Creation of payment plans – plans generally allow a borrower extra time to pay their loan without added fees or interest rates. However, many states limit consumers to one extended payment plan each year. Sen. Mike Cunningham, who sponsored the Missouri bill mentioned above, says it will protect consumers from some of the practices payday lenders have utilized for so long. Missouri’s proposed reform comes less than two years after a group called Missourians for Equal Credit Opportunity helped put an end to a ballot initiative that would have allowed Missouri residents to vote for or against capping the state’s interest rate at 36%. 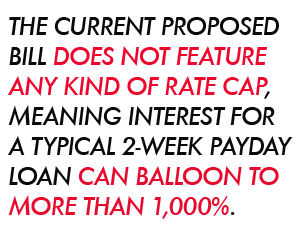 The current proposed bill does not feature any kind of rate cap, meaning interest for a typical two-week payday loan can balloon to more than 1,000%. Had the ballot initiative gone forward and passed, the cap of 36% would fall in line with what consumer advocates deem to be a reasonable rate for consumers to repay without falling into the debt trap. “This is a positive, carefully crafted step toward consumer protection,” Rep. Jim Dunnigan, who sponsored the Utah reform bill, tells The Salt Lake Tribune. Utah has a rather colorful history with the payday lending industry. The current reform bill grew out of scandals involving the industry and former Utah Attorney General John Swallow. Recently, a Utah House Special Investigative Committee found that in 2012, Swallow funneled thousands of dollars he received from the payday industry in hard-to-trace ways in order to defeat a former representative who had pushed for reform of the often predatory loans. On the surface the bills seem to have the best interest of consumers at heart, but some consumer advocates claim these reforms are not as helpful as lawmakers would like people to believe. “Provisions such as these are simply smoke and mirror provisions that allow the predatory debt trap to continue to harm consumers pay-day after pay-day,” says Diane Standaert, senior legal counsel for the Center for Responsible Lending. In fact, when creating the Military Lending Act, which protects members of the military from predatory loans, the U.S. Department of Defense looked at a variety of provisions enacted by states to reign in payday lending. In a report to Congress, the DOD concluded that even with all these “consumer bells and whistles,” the reforms do not stop the debt trap perpetrated by payday loans. For instance, provisions such as the rollover ban in the proposed Missouri law do nothing to protect consumers from predatory lending practices, Standaert says. Lenders could easily circumvent the rollover ban by allowing consumers to repay their existing loan and immediately take out another. Similarly, the cooling-off period – a requirement that a borrower wait a set amount of time before taking out another payday loan – does little. Consumers can just take their business to another area lender or wait the typical 24 hours and take out a second loan. For example, under Florida’s payday reform law, borrowers are limited to one outstanding loan at a time, may not roll over a loan and must wait 24 hours after paying off a loan before taking out another. Despite the provisions, a 2007 Center for Responsible Lending study, “Springing The Debt Trap” [PDF], found that 63% of Florida payday loans go to borrowers with 12 or more loans per year, and 85% go to borrowers with seven or more loans per year. Additionally, 45% of new loans were taken out a day after previous loans were paid off and 88% of new loans were taken out in the same two-week pay period that a previous loan was paid off. Determining the amount a consumer can borrow based on their monthly income, as proposed in the Utah reform, may seem reasonable, but advocates say the lack of underwriting used in the payday industry does nothing to prevent consumers from being on the hook for more than they can actually pay. Additionally, the provision fails to account for the borrower’s other obligations, such as mortgage or rental payments, medical bills, or credit card payments. As such, a borrower could owe more than 50% of their bi-weekly pay to the payday lender and cannot afford to both repay the loan and meet other obligations. Because payday lenders generally have access to a customer’s bank account, they are first in line to be repaid when a paycheck clears. Suzanne Martindale, a staff attorney with Consumers Union, says the ability to pay provision of the Utah bill is rather weak and written in a way that makes it easy for lenders to find ways around it. A true debt-to-finance analysis requirement would ensure that consumers are only borrowing what they can reasonably pay back. Under new federal regulations banks were tasked with determining a consumers ability to pay, rather than just requiring a borrower to flash a pay-stub. Because an average borrower is in debt for approximately 200 days of the year, it makes sense that reform bills would consider a way for consumers to more easily pay off their debt. The inclusion of an Extended Pay Plan in the proposed Missouri bill means that borrowers would have up to 120 days to pay off their loan. The payment plans are based off of the consumers’ pay periods and no interest or fees are charged during the EPP. However, borrowers would only be eligible for the extended plan once a year. While the extended plan could offer a bit of relief for consumers, advocates say, it ignores the fact that payday loans thrive off of repeat customers. Last year, a Consumer Financial Protection Bureau white paper [PDF] found that over the course of 12 months, more than one-third of borrowers will take out between 11 and 19 payday loans. Fourteen percent of borrowers will take out 20 or more payday loans within this same time period. Perhaps most alarming to consumer advocates is a provision in the Missouri bill that would remove the current law that caps interest and fees at 75% of the loan’s original principal, which translates to an annual interest rate of 1,950%. “They have a pretty high fee cap to begin with, but now if they are repealing it, who knows what they would charge,” Martindale says. The current rate cap in Missouri has done little to help consumers. Last year, Consumerist reported on a woman who took out a 26-month installment loan of $1,000 in 2008. After failing to repay the loan her debt ballooned into $40,000 because of fees and an interest rate of 240% imposed by the lender. 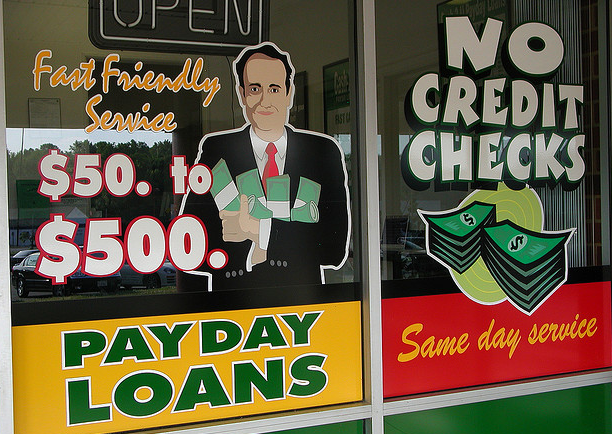 So, what will create meaningful reform for payday lending? A rate cap around 36%, consumer advocates say. North Carolina, for example, once authorized payday lending by exempting payday lenders from its 36% rate cap, the law included a four-year sunset provision for lawmakers to reevaluate the industry effects on consumers before reauthorizing the practice. After seeing the documented debt trap, state legislatures decided not to continue with the exemption. The 2007 CRL report found that after enforcing the interest rate cap, North Carolina saved $153 million. “Following the enforcement of the usury law, borrowers reported being better off and glad to no longer have the product that looked easy to get into and in reality was hard to get out of,” Standaert says. An interest cap would also be in line with the Military Lending Act, which effectively forbids the offering of payday and auto-title loans to active-duty service members by capping interest rates on all affected loans at 36%. THE FINAL DAYS OF PAYDAY? It’s important to remember, Standaert says, that since 2005 no state has passed a law that would legalize the 300% APR payday loan product – since that time a number of states have rolled authority back and enacted provisions such as rate caps to limit the debt trap. Martindale, with Consumers Union, says the solution for ending predatory payday lending rests in the hands of the CFPB who has authority over payday lenders. In the meantime, states will continue to discuss and perhaps implement reforms full of “bells and whistles,” and only pay lip service to the notion of real reform.